Can Coconut Oil Treat Stretch Marks? While some women are happy top wear their post pregnancy stretch marks with pride, most would prefer they vanished completely. According to my wife the kids make enough mess to remind her that she was pregnant, she does not need the marks on her body to further remind her. When it comes to treating stretch marks, women and indeed some men have tried a wide variety of natural methods to get rid of them. These include essential oils, shea butter, coco butter and gotu kola. Recently you may have noticed a number of articles online and in women’s magazines singing the praises of coconut oil with regard to its ability to treat stretch marks and at least diminish their appearance. While there is no doubt that coconut oil contains many compounds that can keep your skin healthy, there here is absolutely no evidence that it can work to diminish your stretch marks and scars. To this point, not a single piece of research has been published so we have to rely exclusively on anecdotal evidence and personal experience. In researching for this article, I read a number of articles and blogs from women who have tried this method. In fairness to some of them, they have documented the effects well and some have posted progress pictures and before and after comparisons. Unfortunately, treating their stretch marks with coconut oil had few if any observable effects for the majority of women. That being said, the majority of these women only tried the treatment for a month or two and this may not be enough time to see any significant improvements. Some women maintain that using coconut oil for longer than just a few months can have a very significant effect. Treating scars of any kind topically typically requires at least 6 months of regular application before you start to see any demonstrable results. This is true whether you are using a topical cream, an essential oil or even a silicone scar sheet. If you are going to use a topical remedy to treat your stretch marks, you can expect it to take a lot longer than a few months before you start seeing even a small improvement. Unfortunately, slathering your body in coconut oil for the next year may not sound like the most appealing prospect. Being Overweight : When you are overweight, more stress gets put on you skin and it effectively stretches your skin out. Gaining Weight Fast : This can cause more dramatic looking stretch marks because your body and skin has not had the necessary time to adjust. Losing Weight Too Quickly : Although this is a less common reason for developing stretch marks, it is still a factor. Corticosteroids : These medications such as prednisone can also cause you to gain weight and develop stretch marks. Breast Implant Surgery : Unsurprisingly, breast implants can cause stretch marks because of the weight gain and skin stretching in your chest. Gender : Women are far more likely to develop stretch marks than men. Genetics : There is not much you can do about the hand you were dealt but genetics can play a huge role. Can Coconut Oil Help Prevent Stretch Marks? 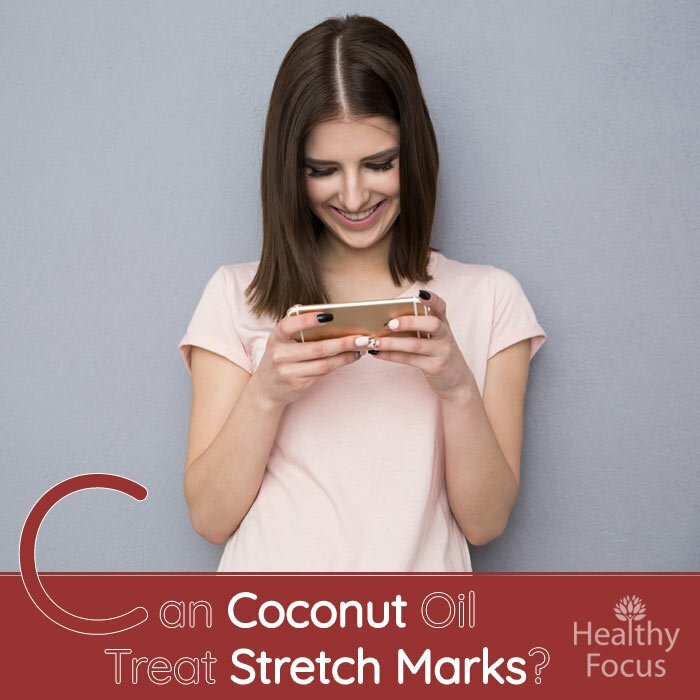 Given that the evidence that the remedy can remove or diminish the appearance of old stretch marks is so thin, is it possible that coconut oil can prevent them from occurring in the first place? Coconut oil has excellent moisturizing properties that help nourish the skin. It is easily absorbed and contains antioxidants and vitamins that are great for the health of your skin. But can it help prevent stretch marks if you apply it throughout pregnancy? They started applying the coconut oil during either the second or the third trimester of pregnancy. They applied unrefined oil twice a day or more usually after showering. Some of the women continued the treatment after giving birth. Unfortunately, only a very small minority of the women claimed that they had not developed stretch marks or developed just a few towards the end of their pregnancy. It is possible the treatment can work for some women but it did not prevent the majority of women from developing the usual stretch marks. That being said, let us take a look at the most popular ways of using coconut oil to treat your stretch marks. You can simply use your coconut oil on its own or combine it with some other skin friendly ingredients like coco butter and shea butter or even an essential oil. Simply massage a few drops of unrefined coconut oil into your stretch marks. Leave the oil on your skin until it has completely absorbed. Repeat twice a day for as long as necessary. Remember that results, if they come at all will not be obvious for at least 6 months. Combine an equal amount of all three ingredients in a cup. Warm and melt your mixture in the microwave. Add a little vitamin E oil to the mix then massage it into your stretch marks. Let it work on your skin until it has fully absorbed. Mix an equal amount of olive oil into a few drops of virgin coconut oil. Massage it thoroughly into your stretch marks. Let it sit until it has absorbed completely. Add a few drops of your chosen essential oil to your coconut oil. There are plenty of skin friendly oils to choose from including lavender, neroli, frankincense and camphor essential oil. Mix it up well and then massage it into your stretch marks. Repeat the process once or twice a day for at least 6 months. So, if coconut oil does not work for you, what other options are available? Unfortunately, the news is not much better when it comes to other popular home remedies like shea butter and cocoa butter. That does not mean that these oils are not good for you. Whether you are using jojoba oil, coconut oil or an essential oil of some kind, they all provide your skin with some good hydration. Unfortunately, research suggests that hydration does not necessarily help treat stretch marks and the same thing applies to cellulite. Ethocyn is a patented ingredient which took some 20 years and over 20 million dollars to produce. BCS Pharma which owns the patent claims that it can return your elastin fibers to those of your younger days. The capsules are broken open and applied to the face to help rejuvenate the facial skin. Unfortunately, Ethocyn is extremely expensive and applying it topically to your body would be unpractical for the vast majority. While the evidence that we have seen does not look very promising, please let us know if coconut oil has worked for you or whether you have any other natural remedies that are effective. We would be delighted to hear from you about your experiences . Good luck.